Dream Dogs Professional Training — Start puppy right and enjoy the process. We know firsthand that training puppies is a skill of its own. Just as for human baby parents, your new little bundle of canine joy is continually going to test your patience. You should expect to be tired, but you don’t need to be frustrated. The payoff for starting early and shaping your dog’s behavior from a young age is huge, not to mention critical to its future success. Even a genetically “average” puppy can be transformed into a remarkable working dog when he matures…if you teach it how. Through a program of supervised socialization, operant conditioning exercises, and drive/instinct building, we can help you start your puppy out right, preventing unwanted behavior and laying the foundation to raise a highly social, well-balanced, and temperamentally sound dog. 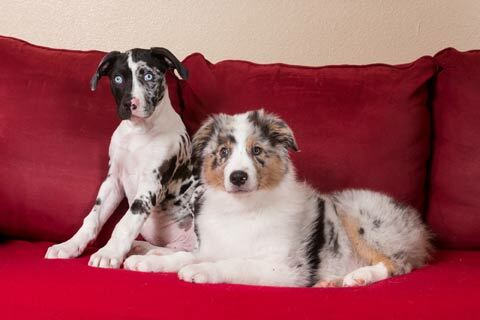 Requirements: Our puppy programs are designed for young dogs ages 12 weeks to 6 months. All puppies must be healthy and current on their first two vaccines. Please bring proof of vaccination to your first class. We start you and your puppy out right with a class chockfull of all the information you need to begin training. We teach you how best to communicate with your puppy and cover the following skills: sit, down, stay, loose-leash walking, and coming when called. We also address common behavioral issues that arise during your puppy’s key developmental stages. You’ll learn the most effective ways to curb some of the most frustrating problems, such as potty training, chewing, biting, and jumping. Additionally, we give your puppy the opportunity to socialize with other vaccinated puppies in a safe, controlled indoor environment, all under the watchful eye of a skilled Dream Dogs trainer. Sit. down. stay. good puppy! Let your puppy burn off some energy and enjoy seriously fun off-leash play in a safe, indoor controlled environment with other vaccinated puppies. This social gathering starts the important developmental task of exposing your puppy to novel objects while you both work on building trust. You'll have plenty of time to ask questions and get information on all of your puppy-raising questions, including potty training, chewing, and the most effective way to teach practical skills such as coming when called.